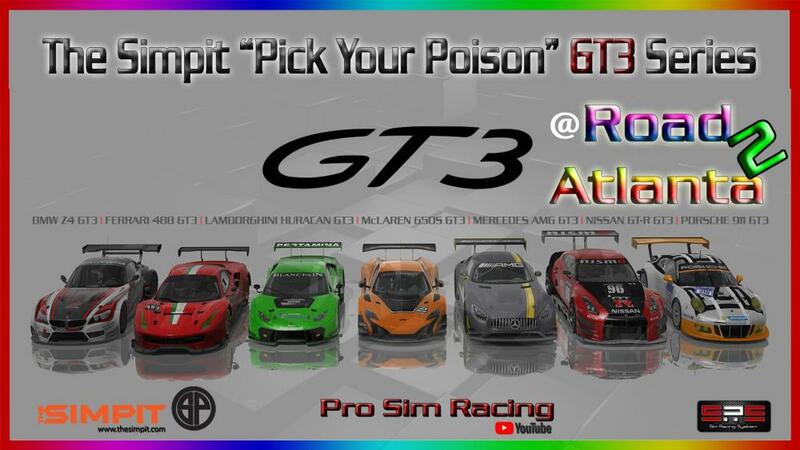 Here we go, this time around we have something pretty special, welcome to The Simpit "Pick Your Poison" GT3 SRS Series. This time around we'll have the choice of seven GT3 cars, never have we done this before on the channel or any Simpit series. Tonight we will be running the McLaren 650S GT3 in race two at Road Atlanta. DISCLAIMER: When you purchase with one of our links we’ll receive a small commission at no extra cost to you. Your purchase won't cost any more than it normally does but it will help support the channel which allows us to continue to make even better videos and help grow our Sim Racing community. Thank you all for watching and being such great subscribers! All of your questions, comments, and feedback are welcome, it will help us to make even better content for you all to enjoy. Don't forget to Like, Comment and Subscribe for more videos, and make sure to click the little bell icon next to the Subscribe Button in order to be notified whenever we upload new videos. Feel free to come out and join us on the track, just go and register with http://www.simracingsystem.com and get ready to have lots of sim racing fun amongst a great group of people. Video Recorded & Edited by Sean Seebran.